Yes, you can selectively manage and control what you allow to record to FullStory. To supplement domain blocking, you also have the ability to add filters for client IP addresses and User-Agent substrings. Simply navigate to Settings > Recording to add targeted exclusions. Exclusions need to be added one at a time (we don't accept comma separated lists). Many customers want to omit traffic generated by their employees, who work behind a shared IP address. When you add an IP address to the list, and any client browser with that IP address that visits your site won’t have a FullStory recording generated. You can wildcard (*) each part of the IP address, where each part is separated by "." (IPv4) or ":" (IPv6). For example, if you wanted to block both 192.168.1.2 and 192.168.1.17, you could simply supply 192.168.1.*. In addition to blocking IP address by wildcard, FullStory also supports CIDR IP notations for blocking purposes. Robots and automated crawlers aren’t usually an issue for web applications that exist behind a log in. But many of our customers run FullStory on public facing, content-rich sites. And robots can generate lots of unwanted sessions. 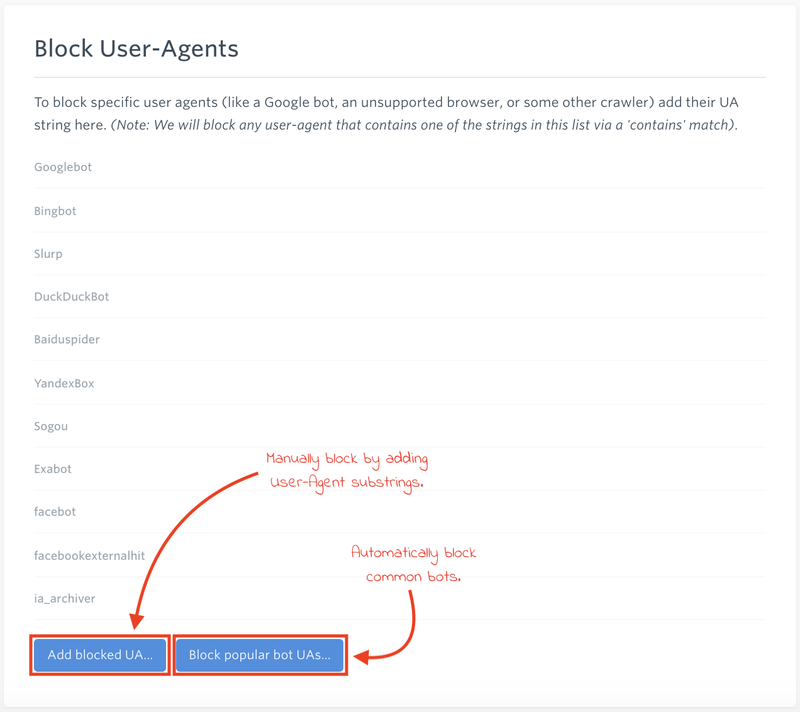 We’ve added the ability to automatically block a list of common bot user agents, or to manually add User-Agent substrings to prevent these visits from generating sessions. If the string you specify is contained at all in the User-Agent reported by the robot when it visits, we won’t generate a recording. You can find the user agent string for each session in the playback view. At the top right of the screen, we'll show details under the user's name. Click on the browser + OS to expand. We'll surface more User Agent details, as well as reveal a copy/paste mechanism to quickly grab the details you need. The user agent details will only be available for a user during a session playback and not available on their main user card, since the details are specific to the session and can change as user's log in from different browsers or machines. After you've copied the User Agent details, navigate to Settings > Recording and select "Add blocked UA..." under the Blocked User-Agents section. From here, you can paste your selection to block visits by these robots. Note: When you turn off recording, sessions that were already underway will continue to record until completed, so you may notice a few more sessions populate even after you've turned off recording.